During the ISMB/ECCB conference in Dublin this July, the 15th edition of the European Conference on Computational Biology (ECCB) was officially announced. ECCB 2016, which will take place in the historic city of The Hague in the Netherlands from 3 to 7 September, is the main European computational event in 2016 and will welcome scientists working in a variety of disciplines, including bioinformatics, computational biology, biology, medicine, and systems biology. The conference organisers presented themselves at one of the booths in the busy coffee area of the conference. 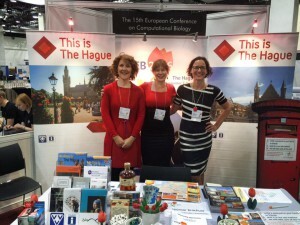 Complete with local liquor, tourist information, and the possibility of sending a postcard home, The Hague showed it was ready to welcome about 1400 researchers from all around the globe. Chair Jaap Heringa also took limelight and announced the first keynote speaker of the conference, Prof Hans Clevers. In an effort to make ECCB 2016 a spectacular scientific event, the full organising committee was present at a “birds of a feather” information session aimed at shaking loose creative ideas from the conference attendees. It is still a year ahead, but ECCB 2016 is waiting for you! 2015 August 25 in News. ← BioSB co-organiser of the ECCB 2016!